Well, for a game between the two best defensive sides in the league I don't think anyone expected there to be 5 goals. We have struggled to beat Atletico Madrid on many occasions over the past few years and this was just another one of those occasions. Atletico scored first early in the first half with a cross from Juanfran on the right (our left) picking out Morata at the far post. Garay let his guard down and let Morata get to the ball for a poke past Neto. 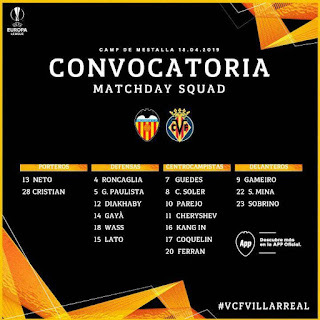 Valencia would respond soon after with Soler picking out Santi Mina in the Atletico box. The latter would dribble past 2 Atletico defenders and pick out Gameiro at the opposite post who had no trouble beating Oblak from that range. Atletico would regain the lead early in the second half with another cross. This time Griezmann would get to the ball ahead of Gaya and head the ball past Neto. Atletico would get several other chances to get further ahead with a goal from Morata ruled offside correctly, as well as a header and a shot from Griezmann both of which skimmed past the post. Valencia would get a gift in the form of a handball confirmed by VAR and Parejo would step up to take it and score. Taking one point from the game would've been a good result especially at the Wanda Metropolitano, however, Correa would yet again hand us a defeat with a long range effort from the edge of the box. He was yet again given the time and space, and Neto remained frozen for the third time in the match. We had some luck by getting a quite sloppier than usual Atletico side but unfortunately defensive errors would cost us the game this time. It was weird to see Guedes subbed off early despite being taken off early the game prior in preparation for this game. The replacement was Sobrino who had been injured up until this point. Other than his involvement in the counterattacking play right after he was subbed on, he didn't really make an impact. Of course, we can't expect that he would add anything so soon after a long injury and I don't see how he was an improvement over Guedes. 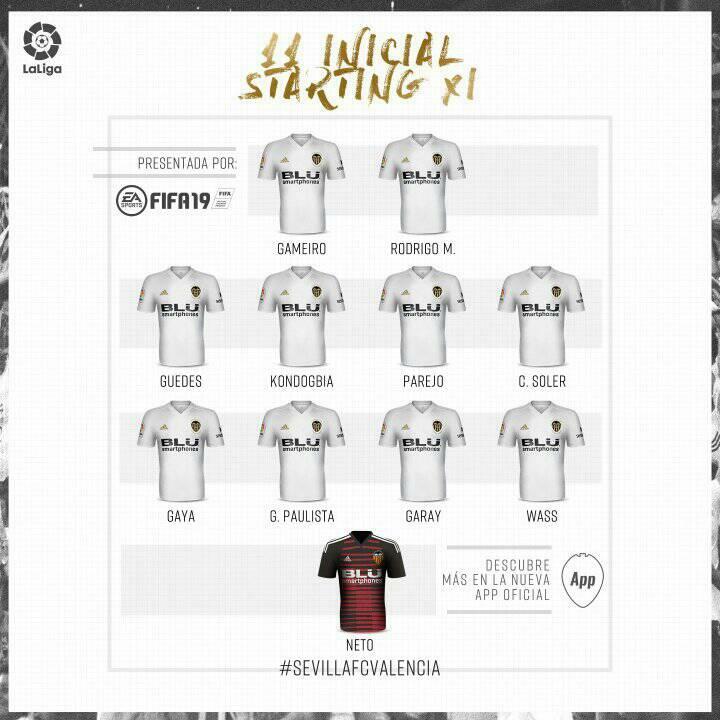 Our bench was pretty weak today due to injuries with the only other viable substitution being Ferran Torres but Marcelino opted just for the one change. Parejo had a great game but a lot of the other players were giving the ball away too easily and wasting possession. It would have been nice to have Rodrigo and Kondogbia in a game like this but it is what it is. The good news is we got Sobrino back, our Europa League opponents are having a poor run of form, and Getafe play a tough game against Real Madrid next meaning the gap will probably be maintained barring an upset. However, Sevilla can now overtake both of us if they win. So a crunch week arrives with two tough away games, Atletico Madrid away on Wednesday and tonight, at Betis. Valencia hasn't won against either of the two big Madrid teams away since February 2011 when a brace from Jaoquin took the points. He's starting for the other team tonight and Valencia's recent lack of success in Madrid means it's important he doesn't go away happy. Getafe beat Sevilla earlier. 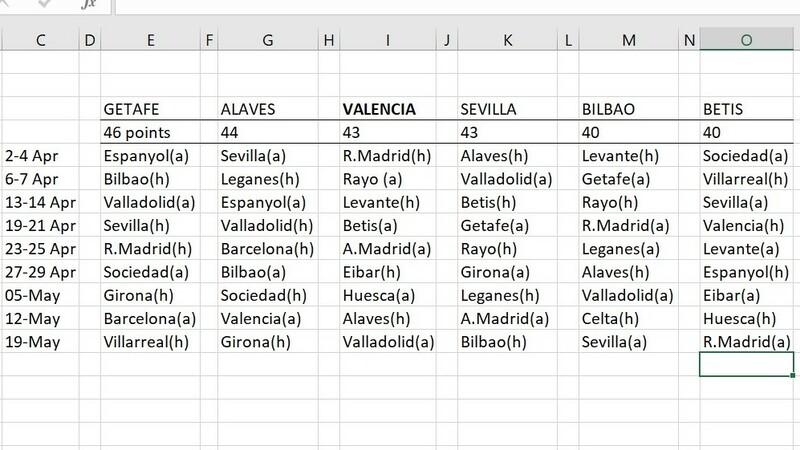 As Getafe have a tougher final set of fixtures this was probably the best result possible and also, from a longer term point of view, if Valencia screw up and don't get 4th, Sevilla are a more dangerous rival than the annoying team of Bordalas. Neither can happen though and it's essential that we get the 3 points and then hope to get something from Atletico Madrid. Drop points tonight and it's hard to see us catching up. Line up is mostly as expected, with the possible exception of Mina up front instead of Gameiro. I guess Rodrigo is still not 100% fit. Mina-Guedes worked well enough last time and both scored in the corresponding fixture last season so here's hoping for a repeat. A mostly frustrating first half. Valencia stood off and allowed Betis lots of possession: it was 74% in their favour at one moment. But a common complaint against Setien this season is that his team have lots of possession without doing anything with it and so it proved. There was a half shot that shaved the outside of the post and a few headers off target but nothing major. Bad news for Valencia as Cheryshev went down injured looking like he twisted something. However, he was able to walk off, so hopefully it isn't too bad. Rodrigo came on, with Guedes returning to his familiar left wing position. 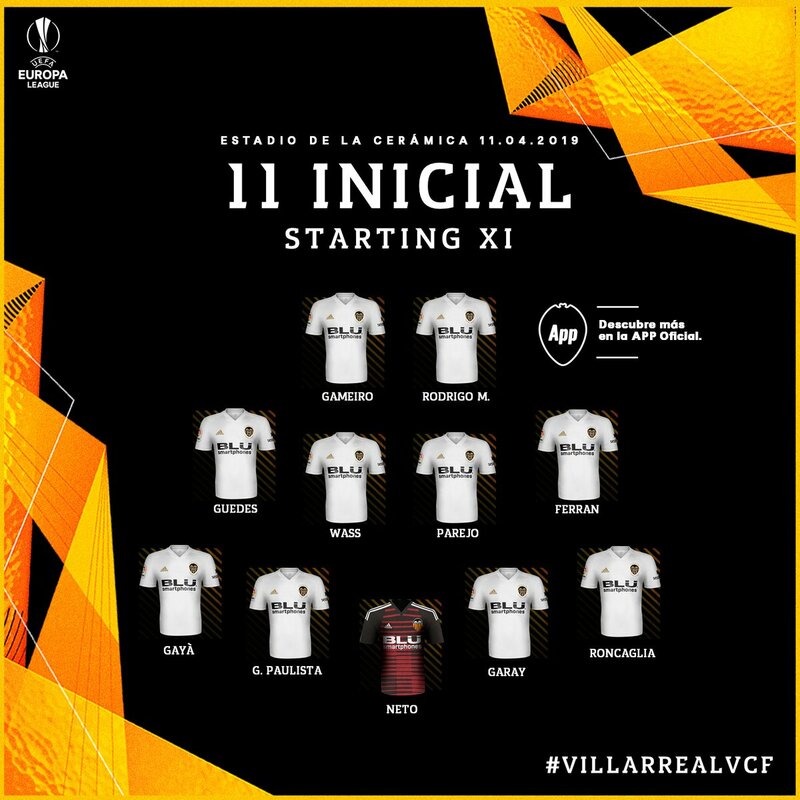 Valencia had created close on zero. I think it was the 41st minute when Valencia even had a shot and that was a tame effort from Mina off target when he was well covered by the defender. The first Valencia shot on target came in injury time and what a shot. Parejo found Rodrigo who drove forward and found Guedes, who cut inside and, with Rodrigo complaining about not receiving a pass, hit a wonderful shot through the legs of the defender to beat the keeper at his near post. Nicely set up for Valencia to hit Betis on the counter in the second half. Valencia got the second half off to a good start, from a short corner, the ball came to Guedes, who again ploughed a low drive through a group of defenders to give us a 2-goal lead. Valencia were looking better and more adventurous and looked comfortable. 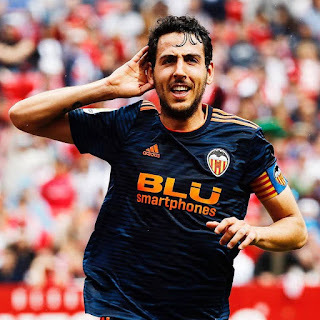 Last year, Valencia had been cruising: 4 up in the Villamarin before imploding in the 78th minute and conceding 3 goals in a short space of time. By coincidence, this happened again. First, Gabriel gave away a penalty to let them cut our lead. Then Rodrigo picked up the second of two stupid bookings to reduce us to 10 men and leave us with a nervy finish. Lo Celso should have had a second yellow but it didn't happen. Despite Betis peppering us with corners our defence held strong. Another decisive performance from Guedes. Given all that, I think we will see Neto and Lato. Giving Jaume a game would have been an option if fit, but playing Cristian would be a gamble too far. Gaya both needs to rest and avoid a yellow, so Lato should get the full game. For the rest of defence, I would risk Diakhaby, even if he gets the yellow, we can cover with any of the other three. Play Gabriel in the centre and Roncaglia at RB. Roncaglia hasn't been great at RB, but Wass needs some time off with Piccini out. In midfield, Guedes should sit this one out with the yellow card threat, meaning Cheryshev starts. In the centre I'd play Parejo and Soler, with Ferran at right wing. I would then aim to replace Parejo with Wass at half time to rest him, and Cheryshev with Kang-In around minute 70. Up front, I'd give Sobrino this game. He needs minutes, especially with Rodrigo out. I'd also give Mina a game to boost his confidence, but with the understanding he'll be subbed off for a rest around minute 60. Valencia were clearly superior in the first half, which was affected by driving rain. We broke the deadlock in the 12th minute. Guedes outmuscled the defender and chipped a nice ball into the path of Lato, who produced a cool finish from an angle for his first senior goal. Valencia should have had more, but Mina made the wrong decision when we had an overload in defence and Gameiro also messed up a couple, misplacing a chip over the keeper when one-on-one. 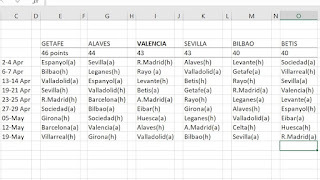 There's a little bit of mild frustration that we haven't got the second goal we need to start making subs with an eye on the upcoming Betis game on Sunday. A little bit of a strange substitution at half-time, Soler being replaced by Gabriel, with a reshuffle moving Roncaglia to RB and Wass to central midfield. The second goal came in the 53rd minute. Parejo's free kick took a huge deflection and it's not even sure he'll be credited with that. Parejo came off just after minute 60 for Coquelin, another strange sub since Coq was on a yellow and we could've just put Cheryshev in instead. Kang-In for Guedes was the last sub. After that, Valencia understandably relaxed a bit, the team hardly ever went past the halfway line. That's ok, but what wasn't was the team's passing became super sloppy and the team barely put more than 2 passes together. Near the end, Coquelin got a yellow card which suspends him from the first leg at Arsenal. It was never a yellow, the Villarreal player blasting it at him and the ball bouncing off his knee on to his hand. Maybe the club can appeal? But as I say, stupid decision from Marcelino to play him when the team had a 5-1 aggregate lead. Good performances from Diakhaby, Lato and Wass with Guedes standing out again. An easy win overall and now Arsenal await.